Customer feedback can come at you from all directions. Online review sites, social media comments, survey responses, customer e-mails, call center notes, online and offline word of mouth. All these serve as valuable sources of information on what the customer really thinks about your brand, product, or service. This is why, at ReviewTrackers, we think it’s crucial for your business to collect customer feedback, as well as analyze the data that you end up with in ways that illuminate the customer experience. After all, feedback is your key to creating customer experiences that inspire loyalty and advocacy. Which begs the question: How do you manage customer feedback? And how can you dig deeper into your data so that you’re able to make perfect sense of it? If you’re looking for inspiration, you got it. 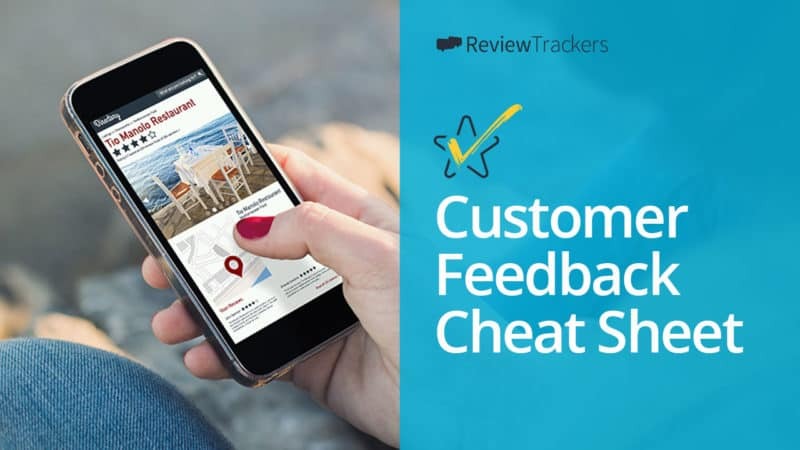 To help you get started, here’s a cheat sheet of some of the most effective tactics and techniques for handling customer feedback the right way. Track all relevant online review sites and customer feedback channels. Keep your eyes and ears open in places where customers are talking. That way, you can join the conversation wherever it’s taking place. If your team doesn’t have the time to monitor all the popular review sites and feedback channels you care about (we’re looking at you, enterprise organizations and multi-location businesses), we recommend finding the right technology partner that will aggregate multiple kinds of customer feedback data for you. Set up your business profiles. Chances are, customers or content providers will have already created listings and profiles for your business across the Web (without you initiating anything). A sound local listings management strategy not only helps you keep your finger on the pulse of customer-generated conversations; it also helps you respond more effectively to customer feedback, wherever and whenever you can. Prioritize your touchpoints. With the rise of apps and sites like Yelp, TripAdvisor, and Facebook, one might argue that surveys aren’t as popular or effective as they once were — at least in terms of consumers’ favorite ways of sharing candid feedback. Meanwhile, social listening, sentiment analysis, and real-time review monitoring and feedback management are all the trend. Take this as a sign or call for companies to evolve and prioritize touchpoints accordingly. At the end of the day, what’s crucial is your ability to listen to the voice of the customer — ASAP, if not real-time — and act on data-driven insights to improve the customer experience. Monitoring and collecting customer feedback isn’t enough. Create a process. How you respond to customer feedback will make an impact on your reputation — and even your revenue. That’s why it’s important to create a detailed, step-by-step process or flow that will guide you in all types of situations where customers are waiting to hear back from your business. Talk about things like what language and tone to use, what the ideal response time is, whom to share feedback with. The more clearly defined your process is, the more smoothly your customer feedback management program will run. Assign ownership of the process. Who will respond to your latest Yelp reviews and social media comments? Who will take the calls of angry customers or reply to their furiously written e-mails? To increase your efficiency and, at the same time, protect your brand reputation, have someone in your team own the process of responding to customer feedback. Provide resolutions. Most of the time, bad reviews and negative feedback will point to something that needs to be fixed: operational or service issues, problem employees, insufficient training, product shortcomings. When responding, you may feel like you need to explain what caused the problem. But stay resolution-oriented. The customer expects to hear what you’re going to do to deliver a better experience next time — and that’s exactly what your response should contain. Strive for efficiency. When customers share feedback, they expect a response within a specific time frame. Obviously, you can’t spend 4 hours writing your reply to a single review or comment; efficiency is of the essence. Find a way to centralize customer feedback, so you don’t waste time visiting and logging in and out of every review site or channel. This will benefit your team in the long run, especially as you grow your business and generate more unsolicited feedback. Looking for more cheats? Here are 6 Keys to a Successful Customer Experience Management Program. Transform into a data-driven, customer-centric organization. Today’s most successful businesses innovate based on what customers are saying. For them, it doesn’t end with collecting feedback and aggregating data; they also act on insights generated by that data. For your organization to truly transform into a data-driven, customer-centric one, use dashboards and work with technology partners — and embrace the fact that the voice of the customer is one of your business’ greatest sources of learning. Example: A global hospitality brand aggregates and analyzes more than 100 sources of customer feedback data, which the C-suite uses to foster operational improvements, drive bookings, and directly impact revenue. Discover patterns using text analytics, machine learning, and sentiment analysis. Analyzing unstructured feedback data will help you find trends and patterns that may have otherwise remained undiscovered, but which could significantly affect customer experience. It can also help you predict future behavior and anticipate customer needs and expectations. Example: An auto service shop saw complaints about oil change, which they actually provided for free. Management traced it back to how staff rarely talked about the offer, under the assumption that customers were in a hurry and only would have asked if they weren’t. Monitor customer sentiment and trends over time. Regardless of whether you’re looking at the big picture or inspecting data at a granular or location level, you can more quickly act on and respond to what customers really think by analyzing customer feedback regularly and over time. Example: A restaurant sought feedback on a daring new menu, then decided to revert to the old one when an overwhelming majority of diners expressed their preference through online reviews and social media comments. Use the language of the customer to refine content and enhance brand visibility. Applying text analytics and sentiment analysis techniques on your customer feedback data can help tailor your messaging, so that the voice of your brand speaks the language of your customers. Example: A fashion retailer discovered that its customers preferred to type “hoodies” over “hooded sweatshirts,” so the marketing team tweaked their website copy and product catalog to improve the brand’s search relevance and align their efforts with shoppers’ search behavior. Measure sentiment to drive customer happiness and loyalty. Understanding how customers really feel — being able to measure their sentiment — is crucial in keeping them loyal. Through analysis techniques, you can extract attitudinal information (mood, emotion, etc. ), identify areas of customer unhappiness, and create structured opportunities to improve sentiment and inspire loyalty. Example: Despite high ratings and positive reviews, a global chain found that its customer retention rate was not improving. The Customer Success team drilled down for details and fixed issues to improve sentiment and reduce attrition. Keep the customer front and center by managing their feedback the right way. By following the tactics and techniques above, you can position your business to deliver customer experiences that captivate and delight — and elevate your brand head and shoulders above the competition.